1. Josh Groban. I know. With me, that one was a given. He's the only one I'll pay to see in concert! I think he's the only one worth paying to see... unless Elvis was still alive. I've seen him perform in Boston and Las Vegas. When I see him in August, I won't have to travel! I'll actually be able to walk from the place I'll be living. I love him! 2. Hayley Westenra. She's amazing! I love her voice. Anyone who gets to sing with Andrea Bocelli at the age of 18 is OK with me! 3. Johnny Cash. Ring of Fire, Walk the Line, Cry! Cry! Cry!... need I say more? 4. Elvis. He's the king. When I came back to Utah last summer, I stopped in Memphis with my friend and we ate at a place called Coletta's. We talked with the owner and she told us stories of Elvis and hanging out at Graceland. 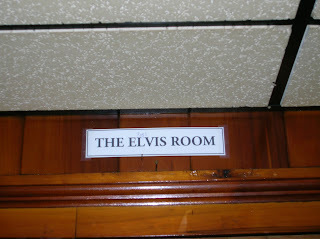 Then she brought us to "The Elvis Room," where he would eat on the rare occasion that he didn't take out. 6. Bon Jovi. I don't know what it is. I just love them! And seeing Jon Bon Jovi on American Idol a couple of weeks ago... yummy! 7. The Rat Pack. Yes, I could list them individually but that would take up 3 spots instead of one. But I do love Dean Martin, Frank Sinatra, and Sammy Davis, Jr. in their own respects. 9. Daughtry. I love them! I never thought I would live to see the day when I had an American Idol finalist on my top ten favorite artists! 10. Enya. See number five for my list of reasons but replace band with person.